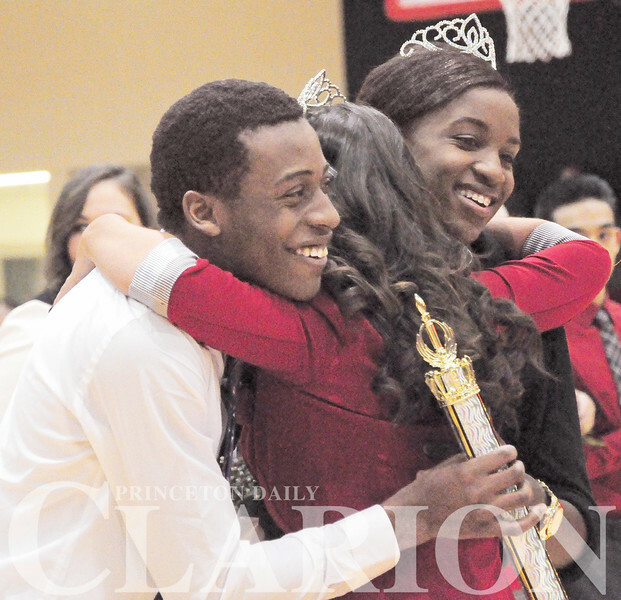 Princeton Community High School Basketball Homecoming King Keshawn Young and his cousin, Homecoming Queen Jackie Young, get a hug from 2015 queen Keela Jones Saturday night at coronation prior to the Tiger Homecoming bout with North Posey. The Vikings beat Princeton 50-42. The new homecoming queen had a few hours to be ready for Saturday's coronation, after the Lady Tigers took a 57-30 win over host Evansville Reitz in their last regular season game.